This is the advance reading copy of People of Darkness. This edition was produced in 1980 by Harper & Row in New York City, New York. 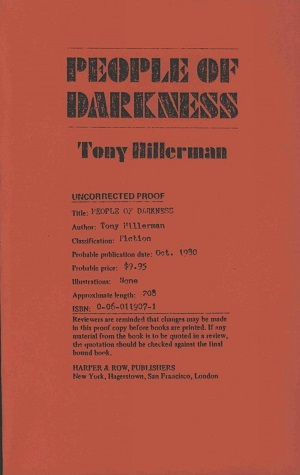 People of Darkness is the fourth book in Tony Hillerman's Navajo Mystery Series and is the first book with Jim Chee as the main protagonist. Unlike Joe Leaphorn, Chee is a young and, in many ways, a more traditional Navajo. "Reviewers are reminded that changes may be made in this proof copy before books are printed. If any material from the book is quoted in a review, the quotation should be checked against the final bound book." Format: Paperback, 20.7 x 13 cm. Binding: Red paper covers and the publishing information printed on the front cover in black.